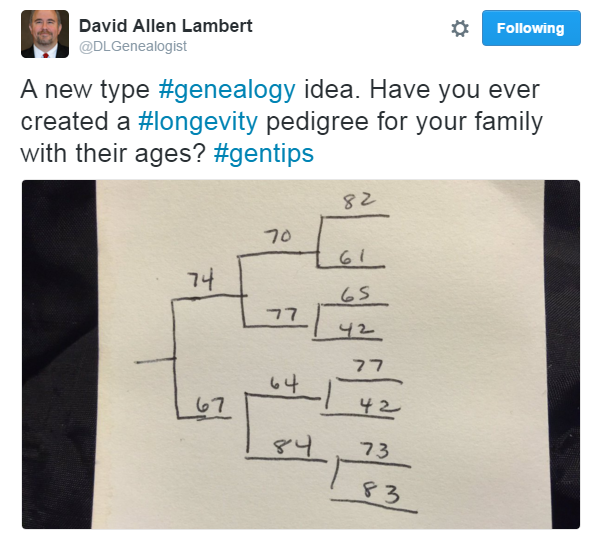 In a recent Tweet, David Allen Lambert, the Chief Genealogist with the New England Historical Genealogical Society (NEHGS), asked folks whether they had created a longevity pedigree. The idea is simple: build a family tree that, instead of names and bio-data, lists each ancestor's age at time of death. What an interesting idea, and yet a bit macabre, right? What if the numbers map out low? That'll surely take the wind out of your sails! Nonetheless, I gave it a go and began tallying the ages through my 2nd great-grandparents. The numbers were a bit lower than I would have liked. There were no centenarians and only a small handful lived into their 90s. The average age of my three deceased grandparents was only 66. Of course, both grandfather's smoked much of their lives, which likely explains one's lung cancer and contributed to the other's heart attack. 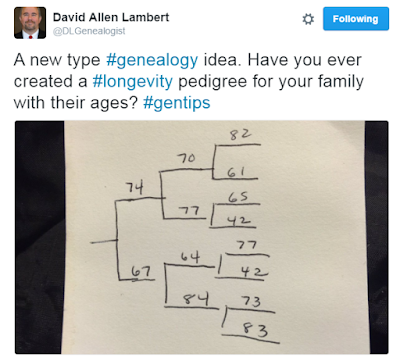 On average, my 27 ancestors featured in this exercise lived to be 69 years old. Jeez, I could certainly use a few outliers to bump that number up! My 14 grandfathers (through 2nd great-grandparents), lived - on average - to be 65.9 years old, which, of course, we will round up to 66. I like to think that I take better care of myself than some of them did. For example, I don't smoke and I don't drink heavily (that ought to exclude several of the early demises from the list). I think I can also cross off the grandfather who died at 36 from black lung since I don't work in a coal mine. And I'm always exceedingly careful when walking on ice, so I don't slip and hit my head like my 2nd great-grandfather who died at 37. My 13 grandmothers (through 2nd great-grandparents), lived - on average - to be 72.5 years old, which, of course, rounds up to 73. Clearly, any real longevity in my pedigree belongs to the women. Their average age would likely be higher, too, if it weren't for the unfortunate passing of a great-grandmother at 20 during childbirth. The real winners in my longevity pedigree are my great-grandfather Marion (91), his mother Minnie (92), and another 2nd great-grandfather John (91). Isn't it interesting - considering the higher average age for the women in my family - that two men lived into their 90s and only one woman? While not an appropriate comparison, considering the improvements in today's standards of living, I still wonder how my family's averages stack up against current life expectancy. According to a 2014 USA Today article, the average life expectancy for American women in 2012 was 81.2 years. My grandmothers clocked in nearly ten years below that number. American men, on the other hand, could expect to live 76.4 years. Again, my grandfathers checked out a decade early. Now, isn't that depressing? I'm putting the calculator away. If you need me, I'll be in the gym, eating a salad, dowsing for the fountain of youth. I enjoyed your blog article. I too read David Lambert's post and thought about doing the chart. After reading your blog I think I'll go ahead and do it. Your sense of humor added a lot as well. It was an interesting exercise (even if it was mildly depressing). Thanks for reading and sharing your comment, Kendra. I appreciate it. This sounds like a logical addition to my research and a good way to clear my mind or switch gears whenever I hit a brick wall. I think I'll add the cause of death to see if I can map any trends that may appear. I agree it's an interesting change of gears. Adding the cause of death does sound like a good addition. Good luck and thanks for reading and sharing your comment.